This Russian Chariote gemstone is really a treat for purple lovers. Swirls of purple and some black in the gemstone make it really pop. The beads are amethyst and there is a triangle sterling silver bead with a set amethyst on each side to adorn the necklace part. 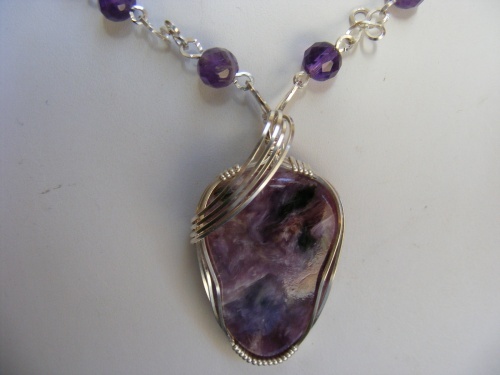 Piece is all sterling silver and measures 20" long and comes with matching amethyst earrings.